A newfound type of rotating stars played peek-a-boo with astronomers, appearing and disappearing a few times each day. The stars seem to act like faulty cosmic lighthouses, spinning and emitting brief and bright flashes of radio waves that are among the brightest objects in the sky, then disappearing from the heavens entirely. The discovery is detailed in the Feb. 16 issue of the journal Nature. An international team of researchers spotted the new stars, called rotating radio transients, or RRATs, using the Parkes radio telescope in Australia. They were searching for radio pulsars-rotating neutron stars emitting radiation-at the time, but couldn't help noticing the blazingly bright flashing objects. While the team found more than 800 pulsars, they discovered 11 of the previously unknown RRATs. The researchers, lead by Maura McLaughlin of the University of Manchester's Jodrell Bank Observatory, determined that RRATs are a type radio pulsars, although they don't emit radiation as uniformly as the conventional version. RRATs fire off a flash from once every four minutes to once every three hours. Some flash even less frequently. Each blast lasts for just a few fractions of a second, so even if you combined an entire day's worth of flashes into one, it would total only about a tenth of a second. However short and infrequent, these sporadic bursts are exceptionally bright. "The flashes of radio waves are comparable with, or stronger than, the pulses from the brightest pulsars," said Andrew Lyne of the University of Manchester. "I guess that there are only a few dozen brighter radio sources in the sky." Still, researchers don't know just why RRATs pulse the way they do. 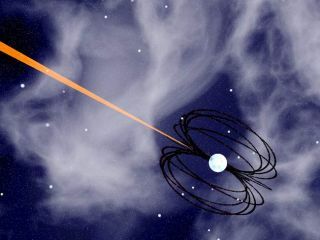 "It may be that these objects are older radio pulsars which are dying and unable to produce normal radio emission," McLaughlin told SPACE.com. Another possibility is that they have high magnetic fields, similar to a magnetar, that prohibit regular emissions. Or, there could be an unknown environmental factor that somehow changes their emission properties. Astronomers expect RRATs to easily outnumber the better known pulsars. "We expect the galaxy to harbor roughly 400,000 of these objects," McLaughlin said. "This is four times as many as conventional radio pulsars." Like a lighthouse beacon, the stars rotate and the beam of radio emissions crosses our line of sight very rarely. So finding the bulk of them will be a challenge. Scientists now plan to aim more sensitive equipment at these new stars to better understand their true nature.